Starting in the coatings industry as a 17 year old apprentice painter in 1971, Tim P. Simpson, Sr. completed his union apprenticeship program in Des Moines, Iowa thru IBPAT Local 246. During these early years he was fortunate to be mentored by older craftsmen he respected. These craftsmen shared their skills teaching Tim Sr. use of tools of the trade, productive techniques in application, jobsite safety, wallcovering skills, trowel trade techniques, pride in a job well done, and how to understand as a tradesman the synergy between quantity and quality. Tim, Sr spent these first formative years painting new homes, commercial buildings and industrial facilities surrounded by experienced career painters. Striking out in his first painting business venture of Hawkeye Decorating, Inc. in 1974 Tim, Sr. continued developing trade skills and also related necessary skills of estimating, sales, marketing, financial management & learning to manage projects and customers’ expectations. Back in these early days before cell phones the latest technology in communication was by pager and pay phone. Returning calls at the end of each day in the field was a necessity to prepare for scheduling the work ahead on various jobsites. Blueprints for projects out for bids had to be duplicated, reserved for use and physically picked up – then returned , or alternately reviewed at a local Plan Center in order to bid projects. The latest technology of the 70’s was McGraw Hill Dodge Data Line microfiche scanned documents service and reader equipment. Tim, Sr. subscribed to this service in order to review and bid more selected projects in less time. This type of efficiency allowed Tim, Sr. to expand his market from the Des Moines area to include other communities in Central Iowa and bid more projects in less time. By mid 1980, Tim Sr. was recruited by a competitor, Willis Construction, whose owners had Tim, Sr. develop new business for them. He introduced principals at Willis Construction to the information technology of Dodge Data Line and its potential to increase sales. Willis Construction was then able to identify and pursue construction projects in selected States. Tim’s first assignment took him to nearby Grand Island, Nebraska helping with the massive rebuilding effort there after an epic series of tornados devastated the city in June of 1980. https://en.wikipedia.org/wiki/1980_Grand_Island_tornado_outbreak Tim, Sr sold and managed repairs, construction of temporary classrooms, and recoating projects on 11 of the Grand Island School Districts’ Schools which were damaged. Tim’s second assignment involved relocating to Texas for Willis Construction spending several years in management of new construction projects in Southeast Texas. By 1982 the Sunbelt States’ economy was expanding as a result of a worldwide oil embargo and the resulting boom to the oil industry in America. Deciding to stay in Texas after completing Willis Construction’s projects, Tim, Sr parted company with Willis and formed Consolidated Contract Services, Inc., a coatings application business, in Texas that same year. The business was a rapid success due to the shortage of experienced construction professionals. Contracts included coatings application services in the manufacturing, hospitality, institutional, waste treatment and commercial building industries. Projects were located across the Sunbelt States from Georgia to New Mexico. After 5 years of growing a diversified coatings and finishes business and seeing excellent growth opportunities in providing contract project management services in the coatings industry; Tim, Sr. determined to evolve the skill sets he had learned over the years. His background as both a contractor and project manager created marketable sales, estimating & project management services. Tim, Sr. offered these services on a project by project basis to other contractors in the industry who needed to supplement their project management teams. Tim, Sr. felt this move would also expose him to a variety of projects across the United States broadening his experiences and further develop his ability to offer Quality Project Management. Tim, Sr. sold Consolidated Contract Services, Inc. in 1987 and began providing mobile third party consulting and project management services in the coatings industry. Tim, Sr. was first recruited under contract in 1987 by Genesee Painting Company, Inc., a northeastern states’ industrial coatings contractor, to assist with project management and develop new sales from their office in southeast Michigan near Detroit. In 1988 Tim Simpson became a Vice-President and shareholder in Genesee Painting Company, Inc. while expanding their multi-State Business Licensing for the State of Louisiana. Tim Sr. spent 4 years providing contract sales and management services on projects such as the new General Motors Saturn Automotive Plant in Spring Hill TN, Ford Bronco Plant Expansion in Louisville KY, US Airways Maintenance Hangers Expansion in Indianapolis IN, and other industrial plant and lodging facility projects. 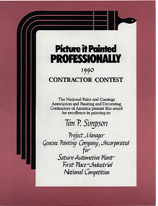 One of Tim’s most notable projects while with Genesee Painting Company was entering and winning the PDCA (Painting and Decorating Contractors of America) 1st Place National Coatings Contest for the Industrial Coatings Project at the then New Saturn Automotive Plant in Spring Hill, TN. The project spanned over 6.9 million square feet of space and was built over a period of 7 years. In 2016 General Motors retooled the plant to produce Cadillac XT5 Vehicles. Overseas assignments were still not available after NACE Training so later in 1992, Tim Sr. was retained by an industrial coatings contractor located in the Pacific NW by the name of F.D. Thomas, Inc. and moved to Medford, Oregon. Continuing to work as an contract consultant and National Association of Corrosion Engineers (NACE) Certified Staff Inspector Tim, Sr. opened a seedling office in Portland for F.D. Thomas, Inc. This improved F.D. Thomas’s mobilization of marketing and equipment resources up the I-5 corridor in the Pulp & Paper, Manufacturing and Electronics Industries. These services included management of coatings projects at International Paper Facilities in Reedsport & Springfield OR, Intel Aloha Campus and Fujitsu in the Portland Metro Area, Texaco Anacortes, WA Oil Refinery, and Tenaska Cogen Plant in Ferndale, WA., among others for F.D. Thomas, Inc.
By 1994 Tim, Sr. had settled full time in scenic Medford, OR and soon established Simpson & Associates, Inc. which provides Commercial and Industrial Coatings Services in Southern Oregon. His past 22 years operating Simpson & Associates, Inc. and an aggregate of 45 years of experience in the coatings industry has provided a sound basis for management of Simpson & Associates SDVOSB LLC’s Quality Control Program as he is now employed by his son Tim Simpson, Jr. Tim’s credentials include certification as a NACE (National Association Of Corrosion Engineers) Level III Certified Coatings Inspector which he continues to perform in the course of his daily work. Tim Sr’s capabilities in facility surveys, budgeting & estimating provides our customers with accurate cost projections for current and future coating requirements. His ability to identify multiple types of coatings failures and calculate useful life of coatings systems enhance our customers’ ability to properly care for their facilities. Understanding what it takes to manage customer expectations has developed repeat customer relationships. Beginning in the coatings industry as a part time apprentice painter in 1985 Tim P. Simpson, Jr. worked under the tutelage of the elder Tim Simpson and various job site foremen on coatings & finishes projects varying from wastewater treatment facilities, to wall-coverings in high rise hotels and churches to painting office structures and retail buildings. After graduation from high school Tim, Jr. enlisted in the Army and served two tours including Korea and elsewhere. After receiving disabling injuries in the line of duty during his enlistment Tim, Jr. retired from the military. Tim, Jr. relocated to Oregon and attended college while working for Simpson & Associates, Inc., graduating from Southern Oregon University in 1999 with a BA in Human Communications. After providing contract estimating and site project management services to Simpson & Associates, Inc. and others for a decade, Tim, Jr. now owns and manages Simpson & Associates SDVOSB LLC’s overall business operations, marketing and on-site project management. Tim, Jr. is actively involved in the continuing development of Simpson & Associates SDVOSB LLC and its market potentials. He brings a background of experience developed in field operations and expanded into management over the years. Tim, Jr’s abilities in communications, training and field management enhanced with his extensive working knowledge of the Commercial & Industrial Coatings Industry make his management of our Team essential to the vitality and growth of Simpson & Associates SDVOSB LLC. Eddie Coen had been with Simpson & Associates, Inc. in the capacity of Field Supervisor since 2000 and has worked for Simpson & Associates SDVOSB LLC since 2012. Eddie had started in the coatings industry in Portland, OR as a painter and progressed into the application of Sealants, Damp proofing, Water Proofing and Floor Coatings after taking a position as an applicator with Simpson & Associates, Inc. in 1996. Eddie Coen now supervises and works actively for Simpson & Associates SDVOSB LLC on our Tuck pointing, Sealants, Damp proofing & Water Proofing projects while training our other technicians in the proper procedures of the trade. He has managed the completion of numerous projects from New Jail Facilities to Waste Treatment Facility Projects. Eddie Coen’s progression into field supervision as his skill levels in coatings application and field management has been the orderly progression over time of Technician into Management. This steady growth of his skills and abilities now personifies itself in Eddie’s position with our firm today. We consider Eddie Coen to be pivotal to the successful performance of our projects for years to come. Eddie is a member of the 20 year club. Tom’s field has been in industrial coatings for over 45 years. He has worked world wide on sandblasting and painting projects in industries including petro chemical, Pulp & Paper, ships, bridges, water towers, boiler stacks, and tanks. His range of projects have taken Tom from Saudi Arabia to the Alaskan Oilfields on to the Golden Gate Bridge in San Francisco Bay. Tom has resided in Southern Oregon where he initially worked for Simpson & Associates, Inc. as a Field Production Supervisor beginning in 1995 and continued offering Simpson & Associates SDVOSB LLC his technical support services. Tom has recently retired and assists Simpson & Associates SDVOSB LLC on a case basis when he isn’t fishing, hunting, or tending his garden. Tom’s abilities in rigging safety, industrial surface preparation, knowledge of coatings composition, and years of experience in field supervision have been a valuable asset to the firm. Tom is a member of the 20 year club.